Since a few weeks ago my nexus 6p has stopped Playing sound via speaker or via aux( only sound via Bluetooth works). Also camera isnt working at all and everytime I answer a call my Phone just crashes after a few seconds. I've tried deleten my cache, running my Phone in save mode, deleting apps and also a full restore to factory settings. Nothing seems to be working. And on top of all of the above my 6p is still not getting the latest Android update to nougat even though I applied for Android bèta. Help is much appreciated. If that doesn't help, then contact Google or Huawei for warranty repair. I have the same issue. I don't get any sound when watching a movie via Google Play, same with listening to Play music. I still get notifications from text apps. 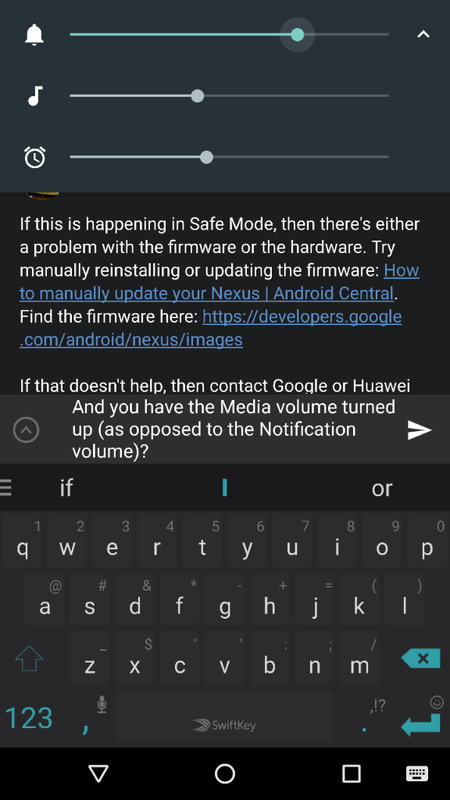 And you have the Media volume turned up (as opposed to the Notification volume)? Same problem.....anyone got a fix yet? You have the same problem where neither the speakers nor AUX jack produce any sound but Bluetooth works fine? And you've tried the same things (Safe mode; Factory Reset and setup as new)?